This was a commissioned piece for an Interior Designer. Some times you just can't get the exact painting you need for a room... but Fifi CAN do it for YOU!!! Hello Designers... To The Trade rates are available... email me and I will paint for YOU!!! Nowwwwwwww... I'm off to finish ANOTHER set of paintings for a room... I will be showing you the colour process and results on Monday... ENJOY your weekend and be sure to visit Beverly and her PINK participants on Saturday! P.S. Special Rates in My Gallery Shop and My Etsy Shop... come shopping and if you don't see the painting you want for sale... contact me... it might be available... and ALL of my paintings are available as signed prints and frameable notecards!!! You definitely pull it all together beautifully. Oh my, how talented! Beautiful. Splendid, all put together very well. Gorgeous! Love the way you were able to pull the different elements together into one beautiful painting. She is a vision of beauty. The new owner is going to adore this. Happy Pink Saturday Fifi. Love the painting. This is so so pretty, love the gown & those splendid shoes. Beautiful and fun. I am finally back to blogging, or at least trying. This illness has kept me down for almost 9 weeks now. I go back to the doc on July 9th and am hoping he will release me to go outside again, but I have followed all the rules, 8 days in the hospital was enough for me to listen. I do NOT want to go back. Now I love this beautiful creation of yours as always. The dress is exquisite and I LUV those shoes. This lovely vision is gorgeous strolling on the streets of Paris. The cameras would be clicking as she strolled on by. I love it sweetie. As always, bravo. I am clapping for you, please take a bow. Love it Fifi! Beautiful work. I had to call my daughter into the room to come see your painting, and we both adore it! 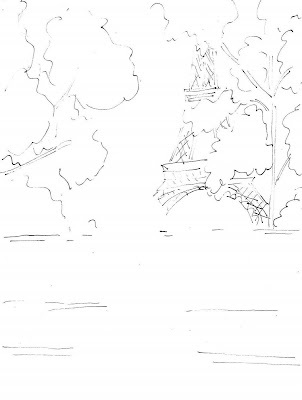 She visited Paris a couple of years ago, and has been yearning to go back ever since. I'm thinking that you're never the same person again, once you've been to Paris! I'm so happy to see this beautiful painting for my first ever Pink Saturday, and it's so nice to meet you! Really fabulous Fifi, I love where we find inspiration as artists! I love the painting..all of your painting are just wonderful. PS has grown so large that I'm picking another creative strategy for visiting those that I haven't in a while. Have a wonderful day. Pop in for a visit if you are out and about in blogland! Love your paintings, love the pink dress. Happy Pink Saturday! 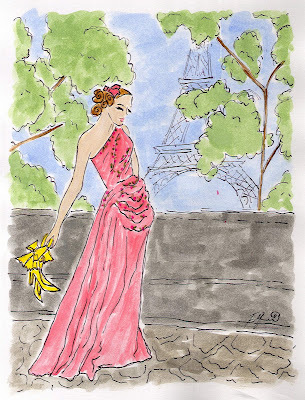 I love the pretty pink Dior dress, painting and with the Eiffel Tower in the background. Good morning, Fifi. I posted your "button" in my blog, it looks great there! Have a good Sunday! Such a lovely painting Fifi. I love your style of painting and your fashion illustration is wonderful. Lovely! Love the dress too! It's always a pleasure to come by and see what marvelous creations you are working on. I LOVE this beautiful Paris gal, she is simply divine.